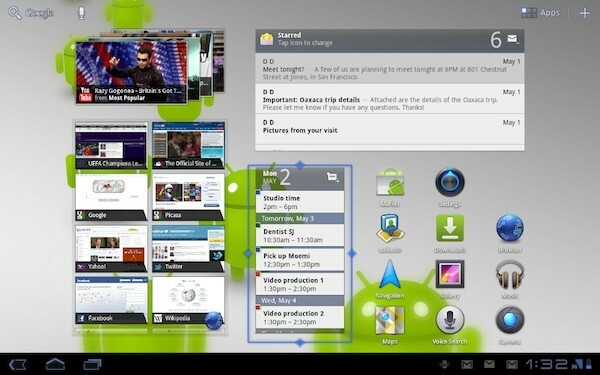 Google announced the release of Android 3.1 Honeycomb and is already available for Motorola Xoom in US. The new update brings a range of improvements including resizeable widgets, to import pictures direct from your digital camera, a new host mode has been implemented. Also concerning the USB device you can expect improvements from the update. Xbox 360 and PlayStation 3 controllers can now be connected via USB or Bluetooth. A new Books app, a new video editing app dubbed Movie Studio, and updated versions of most of Google’s main apps, including a “faster” web browser with a new ‘Quick Control’ menu. It’s also expected that the OS will be hitting Google TV this summer. Unfortunately it is still unknown when the Update will be delivered for Tablets other than XOOM running on Honeycomb but Google says that Galaxy Tab 10.1 will be getting the update in the ‘next couple of weeks’. But no infos on when the update will be delivered to countries outside the US. Open Accessory API. This new API provides a way for Android applications to integrate and interact with a wide range of accessories such as exercise equipment, robotics systems, and many others. USB host API. On devices that support USB host mode, applications can now manage connected USB peripherals such as audio devices. input devices, communications devices, and more. Input from mice, joysticks, and gamepads. Android 3.1 extends the input event system to support a variety of new input sources and motion events such as from mice, trackballs, joysticks, gamepads, and others. Resizable Home screen widgets. Developers can now create Home screen widgets that are resizeable horizontally, vertically, or both. Media Transfer Protocol (MTP) Applications can now receive notifications when external cameras are attached and removed, manage files and storage on those devices, and transfer files and metadata to and from them. Real-time Transport Protocol (RTP) API for audio. Developers can directly manage on-demand or interactive data streaming to enable VOIP, push-to-talk, conferencing, and audio streaming.